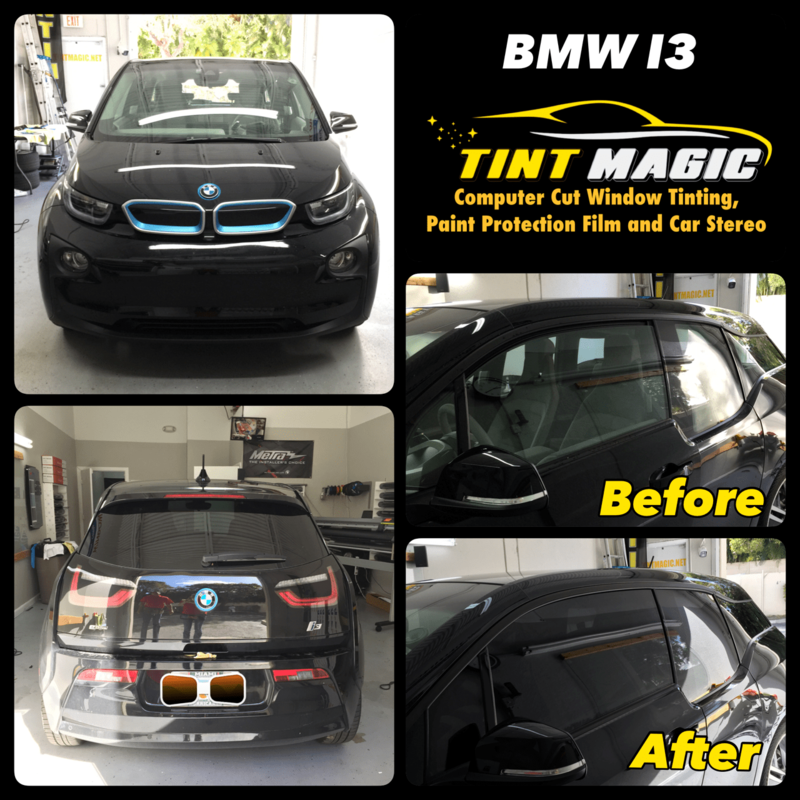 BMW I3 at Tint Magic Window Tinting serving Coral Springs, Parkland, Tamarac, Coconut Creek, Margate, Sunrise, Weston, Deerfield Beach. We have installed SunTek CXP Nano Carbon for the best heat rejection and more than 99% UV protection. Call us for the best quality and service! (954)840-7883. We are located at 11344 Wiles Road Coral Springs, Fl 33076. With its carbon-fiber/aluminum structure and electric powertrain, the i3 advances BMW’s legendary driving dynamics into the future. It handles well due to a low center of gravity; in our testing, it went from 0 to 60 mph in 6.5 seconds. The EPA estimates a battery-only range of 81 miles; it charges in 3 hours on a 220-volt outlet. An optional gas engine extends the total range to 150 miles, quelling dead-battery anxiety. For 2017, the i3 will have an estimated battery-only range of 114 miles. The automotive future according to Hollywood exists as one of two polar-opposite scenarios. Either it’s sleek and bright, filled with fast-moving pods gliding over flawless, uncongested roads, or it’s dark and dystopian, with kludged trucks and muscle cars roaming dilapidated and desolate highways. Hollywood never dreams of roads jammed full of frumpy electric hatchbacks, but the BMW I3 suggests that’s our more likely automotive future. The materials, the powertrain, and even the awkward design all point to a future of smarter and more efficient cars. If, like us, you’ve noticed that BMW’s traditionally sporty sedans are getting soft around the belly, the i3 might convince you that the Bavarians have now swung to the opposite extreme, still eschewing athleticism but now adopting a Fair Trade, locally sourced, Whole Foods outlook on building cars. The drive-mode chassis-adjustment selector here tops out at Comfort and the closest the i3 comes to a Sport+ mode analogue is Eco Pro+, a self-inflicted driving purgatory where top speed is limited to 56 mph and the climate-control system blows only unconditioned air from the outside. Around the skidpad, tires barely wider than an adult hand manage just 0.80 g of lateral grip with the undefeatable stability control nipping at the brakes. But while it’s difficult to wrap your head around the i3 as a BMW, it makes perfect sense as an ambassador for the future of driving.